Venturi nozzles enable the measurement of flow rates in pipelines by reference to changes in fluid pressure when passing through a constricted area. 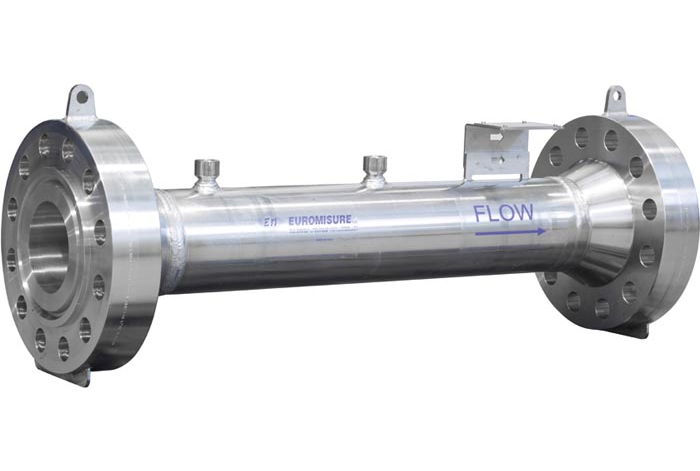 With Venturi flow meters, you will see notably better pressure recovery compared to orifice-style flow meters. One of the most important equations in the industry is the flow continuity equation, which states that the mass flow rate into any given volume is equal to the mass flow rate leaving that volume. Through the continuity equation, we see that a change area is balanced by an inverse change in velocity. Another important equation is Bernoulli’s equation. When Bernoulli’s Equation is combined with the Flow Continuity Equation, we see that a decrease in diameter results in an increase in velocity and a decrease in pressure between any two different diameters. The two diameters are typically the pipe diameter and the throat diameter. A Venturi nozzle can produce a pressure differential using the principals outlined above, and then be measured with transmitters. After passing through the Venturi’s throat, the fluid enters the gradually widening pressure recovery diffuser area, which allows for the recovery of approximately 85% of the differential pressure compared to 40% recovery in an orifice plate. Venturi nozzle flow measurement devices are accurate, reliable, and low-maintenance. They are suitable for measuring most fluids, including gas, steam, and liquids – even if they are dirty or viscous. The key advantages of a Venturi nozzle over most other differential pressure flow meters are low cost, the greater pressure recovery, and the smaller upstream and downstream pipe requirements (from 5 to 20 diameters, depending on layout). The fact that the Venturi meter offers improved pressure and energy recovery compared to other flow meters means it is particularly useful in locations where only small pressure heads are available. Note that by default, Venturi flow meters offer an accuracy of around ±1% of the discharge coefficient. Optimum calibration allows an even greater accuracy of up to ±0.25%. Venturi nozzle flow rate measurement systems are marginally more expensive than orifice-style flow meter systems. However, they are less expensive than most other differential pressure producing devices. The WIKA Model FLC-FN-VN Venturi Nozzle is ideal for liquid, gas, and steam flow rate measurement applications. The sealed and heat-resistant design of this instrument means it is particularly suitable for the measurement of the flow of steam. With WIKA’s Venturi nozzle, users can measure to an accuracy of ≤ ±0.1% of actual flow rate, and a 0.1 % repeatability of measurement. WIKA offers custom pressure taps with its Venturi flow meter solution. The number and exact location of the pressure taps in the nozzle depend on the particular application and are custom designed for each installation. See this WIKA resource page to find out more about how Venturi tubes and Venturi nozzles make it easy to accurately measure flow rates.